Although this diet has been referred to as the Blood Type Diet, it's full, official name is Eat Right for Your Type Diet. It was created by Dr. Peter D'Adamo, a naturopathic doctor. This dietary plan specifies that the foods people should be eating are predetermined by their blood type. More specifically, its premise is that certain foods perform better for individuals with certain blood types than others. In fact, Dr. Peter D'Adamo states that the key to successful weight loss is linked closely to the blood type. He goes on to state that a special diet should be aimed at each specific blood type. He insists that weight loss is critically linked to this specific process of combining certain foods with certain blood types. His reasoning lies behind the belief that each person exhibits different body chemistry. He continues with his belief that individuals with different blood types digest different types of food at different levels of effectiveness. He also believes that individuals who follow his diet plan to the letter will eventually reduce their allergic reactions and symptoms as well as alleviating their incidence of infections and diseases. He suggests that dieters who follow his plan will lead healthier, happier lives. Since human stomachs have varying levels of digestive enzymes and stomach acidity, it makes sense that some individuals than digest different foods more easily by others. Dr. Peter D'Adamo further contends that these varying levels are caused by differences in blood type. He believes that following a diet directed for a specific blood type aids the body's digestive processes. In turn, he also believes that better digestion will lead to weight loss. For individuals with type O blood, the diet should be low in dairy foods but high in protein foods. Specifically, the dieter should eat lots of fish and meat. Certain fruits such as oranges and avocados should not be eaten. Regular exercise should be included with this diet plan. For individuals with type B blood, the diet should be high in red meat products and dairy foods. The dieter should avoid eating chicken and bacon. For individuals with type A blood, the diet should be predominantly vegetarian. Fish should be eaten regularly. Red meat should never be eaten. Light exercise should be included with this diet plan. For individuals with type AB blood, the diet should combine the dietary plan of type A with the dietary plan of type B. Therefore, the diet should include fish, red meat, dairy, and vegetables. Only light exercise should be included with this diet plan. In summary, The Blood Type Diet or The Eat Right for Your Type Diet states that a person's specific blood type can be used to determine which foods will respond best with the individual's digestive processes. 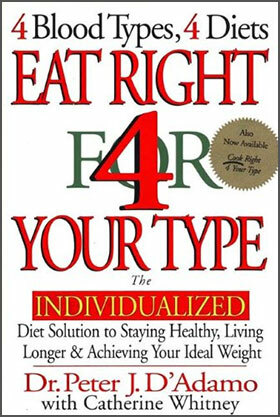 Recipes from the book, Cook Right for Your Blood Type can be used in conjunction with this diet plan. Buy Blood Type Diet Books from Amazon.